Firstly – a huge apology that I get this third Developer Diary to you late. This is because I have been focussing on completing the remaining design elements. But more of that later. As I have mentioned before, we do try to draw a balance between giving you an insight into development, and spoiling the game by revealing too much. Since the Kickstarter campaign took place a whole year before release, we do need to be careful not to give away too much, too early – after all, we still have six months until release. I hope you feel that the balance is about right. The design features some familiar characters and locations while, of course, introducing many new ones. 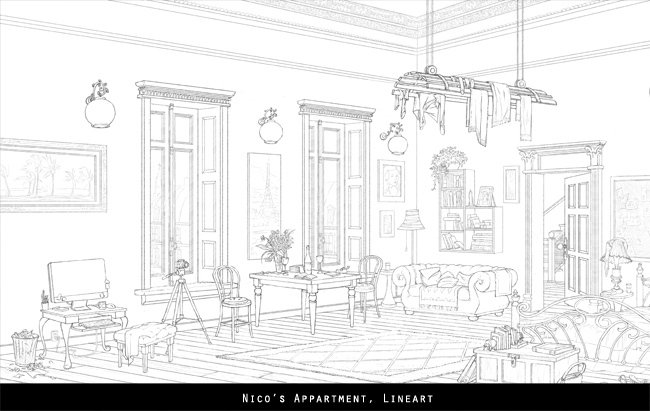 So I thought that you might like to see the updated version of Nico’s apartment against the original - the area of the new assets is 25 times larger. When you get to this section in the game, you will find that a familiar character has done well for herself – and that her cooperation will be vital when George finds himself in big trouble. People often ask whether George and Nico get older as the series progresses. 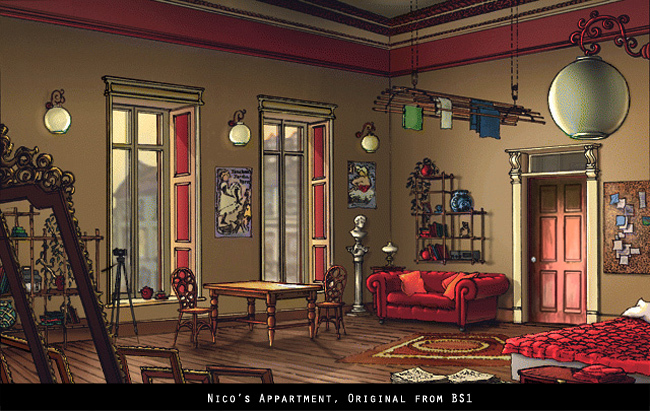 Broken Sword takes a lot of inspiration from Tin Tin, stories that I loved as a child – and still do. Like Tin Tin, the cast of Broken Sword don’t age and, while stories do refer to incidents that happened in earlier games, and characters often appear in multiple stories, it is not necessary to play the games sequentially. I am glad that we made this choice back in 1996 – otherwise Nico and George would now be nearly 20 years older. They would probably be married by now – who knows, maybe to each other, with a football team of little Stobbarts. In theory the design should have been complete by now however, as I mentioned last month, I have been reworking the story to fit with the additional Kickstarter reward locations. 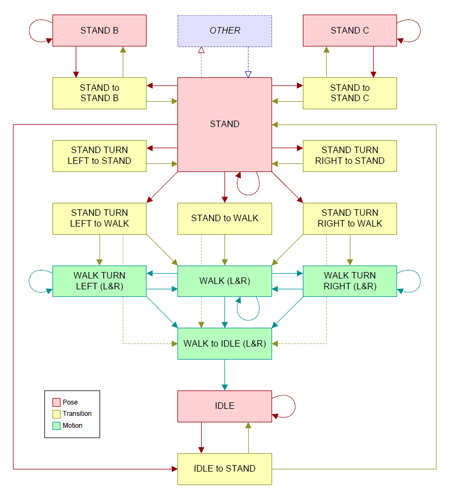 The design for each location must be completed before the concept art can be created, the layout can be drawn and then coloured, and the gameplay scripted. Which is why it is so important to complete the design in good time. Any delay risks bringing the design onto the ‘critical path' - at which point if any one of the critical path tasks are extended then completion is delayed. Hence my desire to focus on completing the design - we are now almost there. That last milestone required having scenes 1 – 21 (about two thirds of the game) playable to ‘alpha’. As a reminder, alpha is defined as being fully playable with art assets complete to a functional level. Also we refine the first few sections to form a ‘vertical slice’ – this being an element of the gameplay that is polished to a quality that is close to final. This vertical slice is valuable to give people a sense of the final look and feel of the game. Which was useful as last week Noirin and I needed to present the game to some key people at the Game Developer Conference in San Francisco. 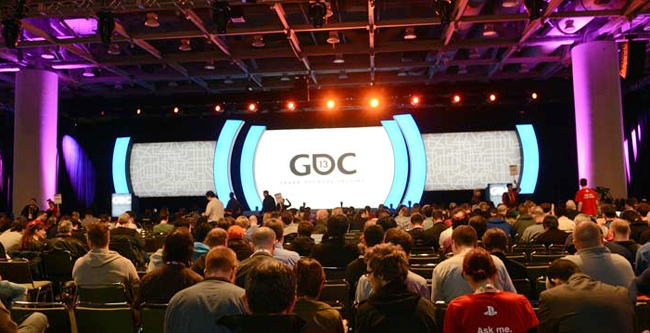 GDC is where 23,000 developers from around the world get together, plus many more people who turn up to meet them – making close to 40,000 in total. Developers actually get on really well and are happy to help each other (unlike film and television people who are quite the opposite). Amongst many other developers, I had the pleasure of meeting with Kevin Bruner, a founder of Telltale (who told me that he is a Broken Sword and Beneath a Steel Sky fan) to exchange thoughts on the future of, and market for adventure games. But I was primarily there to sit on a panel to talk about Revolution’s Kickstarter experiences. It reminded me that even in the short time since our Kickstarter project ran, so many things have changed. EA have dismissed their CEO John Riccitiello, who is judged to have failed to adequately position the company to exploit the market shift to digital distribution. And THQ, publisher of our last two Broken Sword games, has gone bankrupt. The decline of the publisher has removed the traditional potential source of funding – which is why your support through crowd-funding is so valuable in allowing independent developers to thrive! The last milestone required the interface to be complete to first pass. We did explore how the current system can be changed – but felt that it should be tweaked rather than radically changed. Point and Click has been honed over decades and the core mechanic clearly works very well. 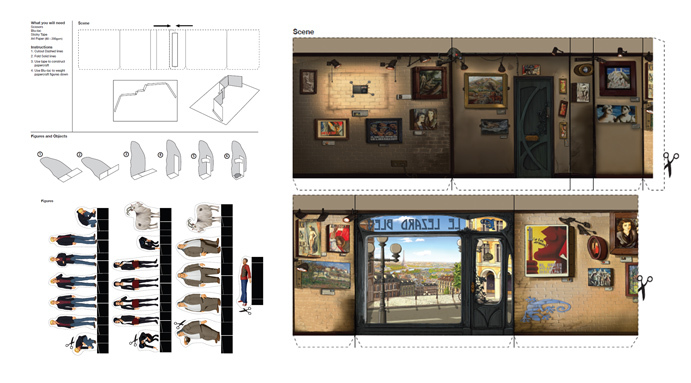 On touch screen, we are pretty proud of the control system that we devised for Broken Sword: Director’s Cut. Last month we ran a competition open to those who received the digital papercraft kit, inviting people to create any kind of papercraft play. The entries were absolutely stunning. Of course, we would say that anyway, but they really were! The winner was The Glass Banana production from Hannah and David Shanks. Their witty video conjures a Broken Sword vibe – it was really enjoyable to watch. Actually they really are all worth watching, and you can find the full list in the forum. We have received so many wonderful messages from people who have fond memories of playing the Broken Sword games first time around. 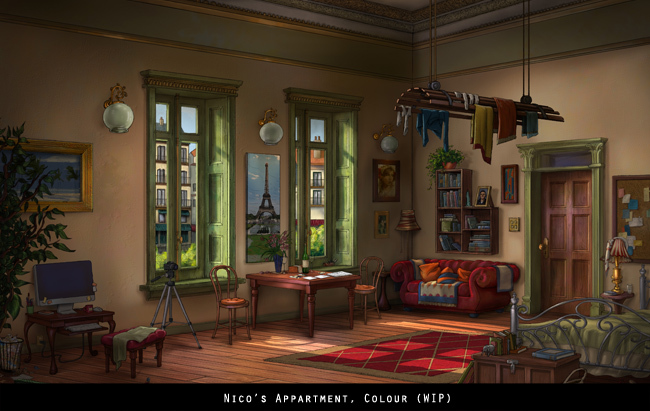 These range from people who were inspired to visit Paris and other locations featured in the games, someone married a French girl who looked like Nico, people whose memories of loved ones involve playing Broken Sword together, and many others. We have posted an invitation to add comments on our forums, and on our Broken Sword Official Facebook https://www.facebook.com/brokenswordofficial – we would be thrilled to read any memories that you would be happy to share. 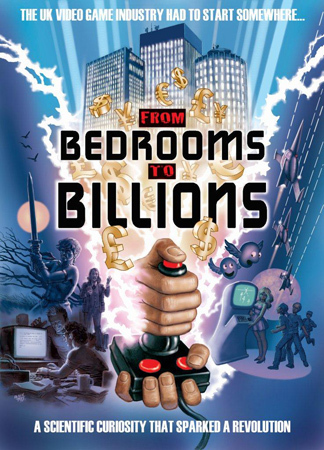 And finally… For those who are interested in the early days of the UK computer games industry, Anthony and Nicola Caulfield are currently running a Kickstarter campaign to make a documentary film called ‘From Bedrooms to Billions’ and have managed to track down and interview the key players from the period – see http://www.kickstarter.com/projects/1195082866/from-bedrooms-to-billions. They are aiming for some impressive stretch goals. My contribution to their documentary, which was filmed on a windy Brighton beach, can be seen on the movie’s website here. That time was a certainly a golden era for independent games development. Just like now. Thanks for reading. In the next Developer Diary I will talk about design, how it translates to script, and the recording process. Plus, of course, a summary of anything else of note that has been happening. Copyright © 1990 - 2013 Revolution Software Ltd. All Rights Reserved.